There are severe delays on Central line after person was hit by a tube train at Leyton underground station. There are severe delays on the entire central line after a problem with the power supply. Tickets are being accepted on buses and Greater Anglia services and passengers are being told to find different routes. 1/2 Severe delays while we fix a power supply fault. Tickets are being accepted on local buses, @tflrail, @greateranglia. 2/2 Please use other routes as trains that do run will be very crowded. It's 20 years since the last Central Line service ran to Ongar. Epping and Ongar Railway are running a special service on the anniversary with a 1960s Tube train. The historic train that ran the last service from Ongar on 30 September 1994 returned yesterday and will run for two more days. St Paul's station is currently closed due a double incident - a person under a train plus a passenger taken ill on the platform. Emergency services are at the scene trying to rescue both passengers. The Central Line is now shut between Liverpool Street and Holborn with delays on the rest of the line as a result. Five teenagers were threatened at knifepoint after witnessing an attack on a Central Line train. Four boys and a girl, all aged 14, were confronted by a man holding a flick knife at Theydon Bois in east London. Detective Constable Carl Wayte, from British Transport Police said: "A man was attacking another passenger on an eastbound Central line train as it travelled between Loughton and Theydon Bois London Underground stations. During the journey four boys and a girl, all aged 14, witnessed the incident and alerted other passengers. 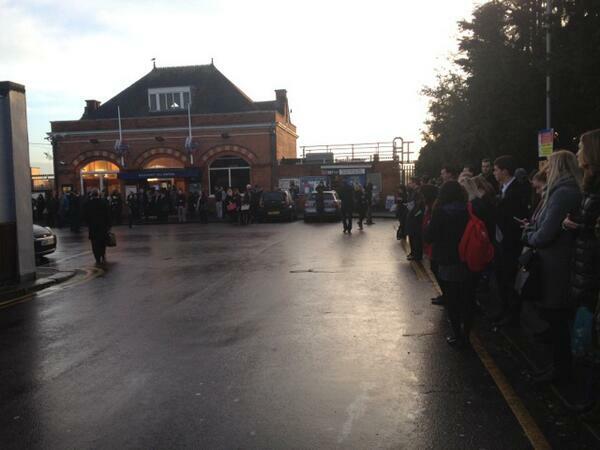 The teens left the train at Theydon Bois and the man also left the service. “He then produced a flick knife and threatened the group on the platform"
Anyone with information is asked to contact British Transport Police on 0800 40 50 40. Transport for London says the Central Line is running again after a signal fault at Mile End, but there are severe delays.